Black pepper is one of the most commonly used spices in the United States, according to Michael T. Murray and Joseph E. Pizzorno, authors of "The Encyclopedia of Healing Foods." 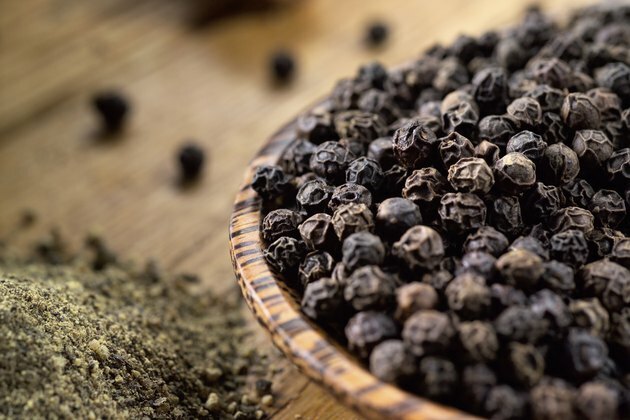 That's for good reason, because black pepper has a bold taste, but the spice is also nutritious and might offer certain health benefits, as well. In other words, black pepper isn't bad for you at all. A teaspoon of ground black pepper contains 6 calories and only a trace amount of fat. That same teaspoon of ground black pepper also supplies 0.6 gram of fiber. That doesn't sound like much, but in that tiny amount of food you get 3 percent of the minimum of 20 grams of fiber you need each day, according to the Harvard School of Public Health. A teaspoon of ground black pepper contains 3.8 micrograms of vitamin K, a nutrient that helps your blood clot normally. That amount is 4 percent of the 90 micrograms women need each day and 3 percent of the 120 micrograms men should have on a daily basis. Black pepper supplies small amounts of iron, potassium and vitamin A, as well. In addition to getting key nutrients when you eat black pepper, your body might be able to absorb all of those vitamins and minerals more easily when you eat black pepper. According to Murray and Pizzorno, black pepper contains a compound called piperine. Piperine can help your body absorb certain nutrients, such as B vitamins, selenium and beta-carotene, more efficiently and in larger doses. The piperine in black pepper can boost the liver's ability to detoxify your body, Murray and Pizzorno note. Black pepper might also aid in normal digestion. According to Murray and Pizzorno, the spiciness of black pepper encourages your body to produce more stomach acid, which makes digestion more efficient. A 2010 article published in "Nutrition Today," reports that black pepper has antimicrobial, antioxidant and anti-inflammatory properties, as well, making it a potentially useful medicinal agent. The simplest way to incorporate black pepper into your diet is to sprinkle it on meals before you eat. You might also add a shake or two to ground black pepper to recipes such as soup, stew, eggs, beans and casseroles. Add pepper toward the end of the cooking process, however, because the benefits tend to break down the longer the spice is heated, Murray and Pizzorno note. Though they may not sound like they would go together, black pepper enhances the taste of vanilla-flavored foods such as yogurt or ice cream. Try this unusual combination by adding a small shake of black pepper to your yogurt or to baked goods that call for vanilla.